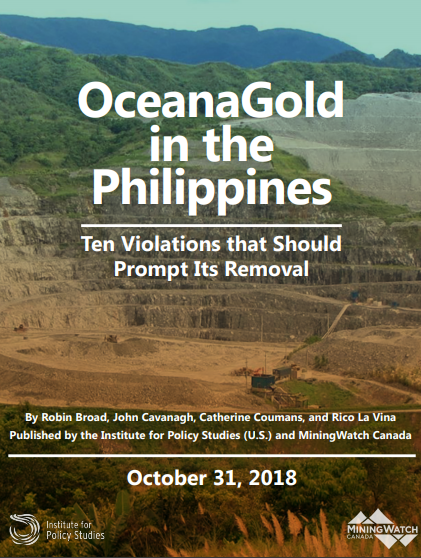 string(1180) "Resource Centre > Uncategorized > OceanaGold in the Philippines: Ten Violations that Should Prompt Its Removal"
The authors of this report—researchers from the United States, Canada, and the Philippines—have studied OceanaGold’s operations in the Philippines and other countries. The have visited the Didipio mine on fact-finding missions four times since 2013 and studied numerous reports and other fact-finding missions on OceanaGold’s record in the Philippines. The authors have carefully reviewed the multitude of complaints about the mine from the local community and provincial authorities dating back to when construction began. This report lays out the results of their investigation, including their finding of numerous violations by OceanaGold of its FTAA and of national and provincial laws and decrees. The report reviews ten areas where there is strong evidence that OceanaGold is either violating the requirements of its FTAA, is in violation of national and provincial laws or agreements, and/or is otherwise violating internationally-recognized human rights. The authors conclude that this mine has significant negative impacts on water, forests, land, indigenous peoples, human rights, biodiversity, and workers’ rights. Hence, the authors support directly affected indigenous peoples and community members, as well as municipal, provincial and national stakeholders, who maintain that the FTAA should not be renewed and the mine should be closed. Given its track record, OceanaGold should also be considered ineligible for the additional exploration permits it has requested for areas around the Didipio mine.